The Italian American Club of Mahopac is dedicated to enriching the lives of all in our community through social and cultural events that reflect our members’ rich Italian heritage. The club has many first and second generation members of Italian descent that are proud of this heritage. Click here to read a brief history of our club and we hope you are inspired by reading this Poem! The Italian American Club of Mahopac is proud to support UNITED FOR THE TROOPS, our 2018 chosen charity. Thank you to all our members for raising a substantial amount of money towards their cause. A thank you also to the Mahopac News for publishing this article. Happy 95th Birthday to our member and WW2 Veteran Joe Vogliazzo. Let us remember our military men and women who will be away from their families during this holiday season. Support UNITED FOR THE TROOPS and help them bring a little comfort to our troops. Thank you to the journal chairperson, Linda Cefaloni, and the entire team for doing such a fantastic job in putting this year's journal together! We also acknowledge and appreciatively thank our MERCHANTS and FRIENDS of The Italian American Club of Mahopac who sponsored the ads and support all the Columbus Day Festivities. Please patronize their businesses and thank them for their community pride and involvement. Grazie! To view the entire 2018 Journal, please click on the pictured cover page. It has become a tradition that every year we film an interview with the Grand Marshal and Honorees to get to know them better and to get their views on many topics. It's also a tradition to have the Marshals prepare their favorite dishes, representing their respective Italian region, and to share and describe their recipes on camera . Thank you to Giulio Cefaloni - chairperson and host of the event; Regina Costello Morini and Michael Simone - 2018 Grand Marshals; Angelo Pugliesi and Salvatore Pascarella- 2018 Honorary Marshals; and Jim Rathschmidt - Founder of United For The Troops (the IAC 2018 adopted charity). Every year, consistent with our mission of being a community focused organization, the Italian American Club of Mahopac adopts a charity and raises funds in support of its mission. Last year, the Club raised $8,000 for Community Cares. In prior years, we have raised substantial amounts for other organizations such as the Multiple Sclerosis Society, Wounded Warriors Organization, Make a Wish Foundation, American Cancer Society, Pajamas Program, Putnam & Northern Westchester Women Resource Center, Drug Crisis in our Backyard. "UnitedForTheTroops was created by friends and families of our Troops serving the U.S. overseas. Our sole purpose is to make life while at war a little better for our brave men and women serving in the U.S. Military by collecting food, money, and goods that the military does not provide them. Some of the items include cookies, dvd’s, cd’s, snacks, t shirts, and other food items. Through speaking with the troops the military provides them with the essentials for day to day life and many of them miss the extra amenities that they receive while at home. Our goal is to show them that we are proud of them and appreciate all of their efforts in Iraq, Afghanistan, and other areas of the world being affected by this war. In May 2007, Luke Rathschmidt, was deployed from Fort Bragg North Carolina with the rest of his battalion in the 82nd Airborne Division of the US Army. Luke is a member of the family who founded United For The Troops shortly after his deployment. While speaking to Luke, he had asked that we send him things like visine, batteries and toilet paper; simple everyday items that we take for granted each day. As time went on Luke began sharing stories of soldiers that did not have any family back in The United States, and noted that he felt bad getting all of the packages we were sending him while his comrades were receiving nothing. Although he was sharing everything we sent him, in Luke’s words “it’s not the same as getting your own”. Thank you in advance for you support!" Congratulations to the winners of our 3rd Annual Putnam's Got Talent Competition. First place winner, John Delgado, performed a superb modern HipHop dance. Second place winner, Sydney Leary, sang "Requiem” from the musical Dear Evan Hansen. Third place winners, Hayden DiTomaso and Emiko Dunn, performed a Tap Duo Dance to the song “Two of a Kind”. This was an exceptional year and the talent showcased by all the contestants was just extraordinary!!! 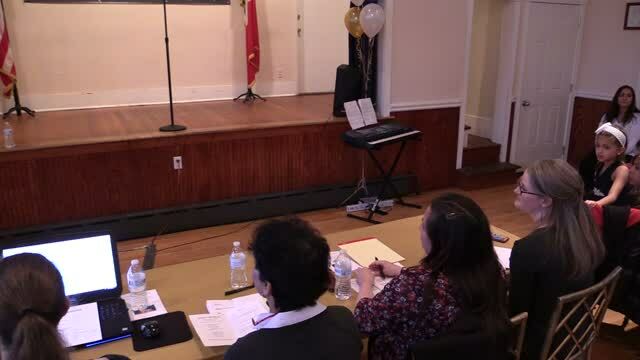 The event, which was a fundraiser benefiting UNITED FOR THE TROOPS, attracted 17 contestants with an audience of over 100 people. Click on the video to see the performances! Click on the links below to hear our beautiful National Anthems and sing along with the lyrics! "Il Canto degli Italiani", is the National Anthem of Italy. It is best known among Italians as "Inno di Mameli", after the author of the lyrics, or "Fratelli d'Italia", from its opening line. The words were written in the autumn of 1847 in Genoa by the then 20-year-old student and patriot Goffredo Mameli. Two months later, they were set to music in Turin by another Geneose, Michele Novaro. The hymn enjoyed widespread popularity throughout the period of the Risorgimento and in the following decades. Nevertheless, after the Italian Unification in 1861, the adopted national anthem was the "Marcia Reale" (Royal March), the official hymn of the House of Savoy composed in 1831 by order of Carlo Alberto di Savoia. After WW2, Italy became a Republic, and on October 12, 1946, "Il Canto degli Italiani" was provisionally chosen as the country's new national anthem. This choice was made official in law only on November 23, 2012. The Italian American Club of Mahopac is featuring a number of great events in the coming months. Click here to see what’s going on e Venite Tutti a Divertirvi! Click on the "f" icon above for the Italian American Club Facebook page!